French soldiers arrive at Jalokhel in Kapisa province after an encounter with insurgents on January 5, 2010. 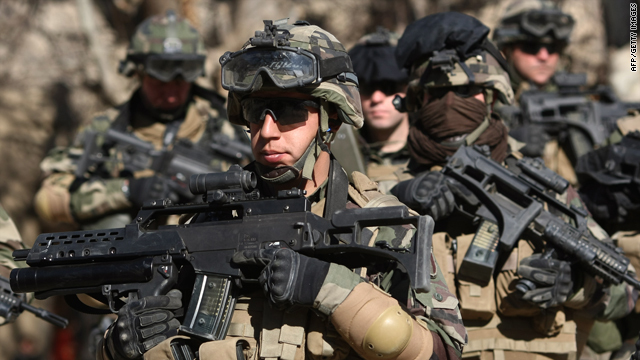 (CNN) -- France will not send any more combat troops to Afghanistan, French Foreign Minister Bernard Kouchner told CNN Thursday, reinforcing his country's opposition to joining the U.S.-led surge there. Kouchner, speaking with CNN's Christiane Amanpour from the one-day meeting on Afghanistan that drew representatives from more than 60 countries and organizations to London, said, "No more fighters. We are in charge. We don't want to send more troops to fight." But Kouchner did not rule out the possibility of sending more trainers for the Afghan army and police. France currently has about 3,500 troops in Afghanistan, just over a third the number that Britain has deployed there. The United States is sending another 30,000 troops to Afghanistan, and NATO and other partners have promised at least 7,000 more reinforcements as part of President Barack Obama's new strategy to protect the Afghan population from the Taliban. Answering a question about the strategy of the U.S. commander in Afghanistan, Gen. Stanley McChrystal, Kouchner said, "With all due respect, he's a military man ... We are concerned by the position of the Afghan people and the government, the legitimate government of Afghanistan." Kouchner said Afghan President Hamid Karzai was adopting a very different tone toward the Taliban, by offering them an opportunity for reintegration and reconciliation in Afghanistan followed by a peace council, with the support of a $500 million "pay-for-peace" plan. But he criticized Karzai's assertion that international troops will have to stay in Afghanistan for another 10 to 15 years. Kouchner pointed to the fact Obama has said American troops will begin withdrawing from Afghanistan in 2011. "We don't have to accept such a long period of battle," Kouchner added. "We want to change the country and to fight against poverty and fight in favor of development." "They (the Taliban) are losing momentum and if you draw people out towards a reconciliation process, this will break the momentum further." Qureshi told Amanpour there will always be an element of the Taliban that will refuse to negotiate. "But there is an opinion that, by and large, the rank-and-file -- they've been in this conflict zone for over three decades -- want a normal life. If you can provide them with an alternative, I think many of them would want to engage." Qureshi said Pakistan is willing to play a role in trying to lure the Taliban into the peace process and show them an alternative way, despite decades of mistrust between Kabul and Islamabad. "It's going to be an Afghan-led, Afghan-owned process," he said. "We are willing to help if the Afghans want us to help." Asked if the U.S.-led surge in Afghanistan will be effective, Qureshi said, "All we are asking for is that the surge and the deployment in Afghanistan should be coordinated with the military leadership of Pakistan so that it does not become counterproductive, so that we do not have negative fallout on Pakistan." Qureshi also acknowledged that U.S. drone strikes on suspected Taliban and al Qaeda targets in Pakistan are having an effect. "The drones certainly have been able to take out some high-value targets, yes. You've got to admit that," he said. But he said Pakistan wanted to have access to drone technology from the U.S. because the Pakistani parliament, media, and people feel it's important for Islamabad to determine how to use them, when to use them, and who to use them against.